At the beginning of this week I was feeling very frustrated with all the goals I’m working on. When you’re in the middle of your journey/progress I think it’s just natural to have those times where you’re just over it. I was just feeling very unmotivated and more so I was just wishing that I could just skip ahead to the finish line. I was thinking that, I don’t want to be in the “working-in-progress” stage, I want to be in the “I’ve-Arrived” stage. Maybe it’s the age we’re in, where we are so used to getting everything instantly. Hard work honestly isn’t as emphasized anymore, and in fact a problem I have living here is the entitled attitude. Why are we rewarding the “underdog”? Why are we rewarding the person who didn’t really try that hard, or who doesn’t really have the skill or talent, but has the saddest back story? Maybe I just sound like an awful, cynical person, but I always thought the one who tried the hardest, who had the most talent, the most skill, the most strength usually won. I have just met so many people at work who roll their eyes at me going to school, and say there’s no point in wasting money on an education because they’re going to be famous one day. I don’t blame them. Why work hard and devote 4+ years to school, with all those student loans when you could become a reality star, or a musician? The reality is, no matter how hard I work at school or my job, Snooki and Kim Kardashian will always be making 10x more than me. But back to the point, I am half way to many of my goals and yet I was still looking up how to stay motivated and deal with frustration online. I honestly didn’t read anything that helped me. Being an ex-psych major reading about Maslow’s hierarchy of needs did nothing for me. I’m sorry but a lot of those well-packaged descriptions of ALL people don’t explain the complexity of both individuals and a constant state of flux. I realized on my own that my frustration was from comparing myself to others. This is one of the worst things you can do to yourself, period. I was comparing myself to people who are already living their best life; people who are traveling all around the world and having fun with friends and family. I was comparing myself to people who have lost 2x more weight than me and whats more, looking at fitness models on Pinterest. I swear women look at half-naked women more than men. My husband probably thinks I’m a lesbian that will run off with another women pretty soon. I was also comparing myself with people who have already graduated and working in good jobs and those people who always seem to fall into dream jobs with no degrees. But the quote I have above sums it up perfectly. Comparison is a killer of motivation and happiness. If you stop and think about where you are now, compared to where you were 6 months ago, or even 1 month ago, how far have you come? How different is your life now? You may not be at your goal, but could you imagine if you never started your journey and were still living the way you used to? Feeling unsatisfied, tired, depressed, anxious, even hopeless. When I compare myself to myself, I see that my lifestyle is very different. Exercise is a priority to me that I really enjoy. I don’t eat all the crap I used to eat. I can’t believe how I used to eat. Now I see food as fuel, not therapy. I see food as natural medicine. I’m pretty sure my body now has choirs singing in celebration. I also can do more physically, carry heavier weights, walk longer, and now I’m trying to build up resistance to running longer. And having lost about 14lbs now I am halfway to my goal. If I hadn’t started, I’d be 14lbs heavier. If I hadn’t committed to school a year and half ago, I wouldn’t be about to graduate from my Associates degree in 4 months. I wouldn’t be halfway to getting my Bachelors and being able to return to Australia to start my new career. I am a lot more productive now because I don’t waste time on useless things. When people around me are eating poorly I don’t participate anymore. I’ve even gotten to a stage where I finally don’t care what they think. I’m not going to let people bring me down because they are unhappy in themselves. My martyr days are over. And even though I threw out my back this week (probably from over-exertion doing weights), and I have to take a break from working out, I still feel reenergized to keep going. 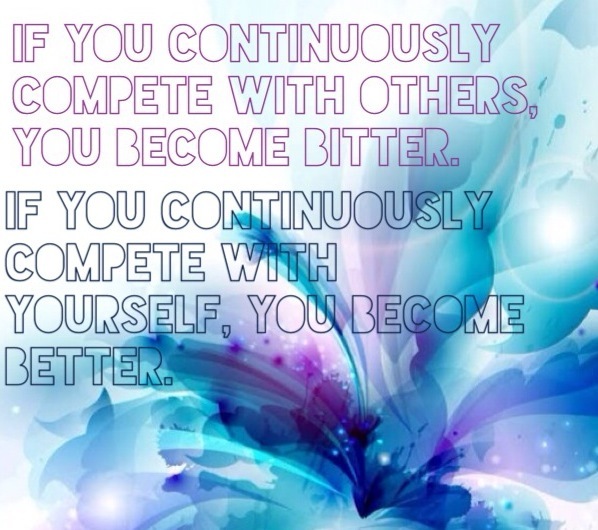 So, don’t ever compare yourself to anybody else. There is absolutely no point in it. Comparing yourself to your own progress is the best source of motivation to be persistent and dedicated to your goals. Girl!!!! There is so much I wanna say to this post- but if I start now, we might be here till next year- but I will say THIS: 1- I feellllll you OMG, 100% all day erry day!!!!! It makes me crazy. 2: I read something recently about comparing yourself to everyone via Instagram and Facebook and whatever else: you are comparing your everyday mundane life to everyone else’s highlight reel. People only lost their BEST moments and BEST shots, never their boring miserable ones. So you’re looking at their best moment through filters on filters on filters. Who wouldn’t get down and become a hater?!?! Try not to let all that get to you- it’s a daily battle for me to keep it real. Thank you! I know what you’re saying. I also think that with models they are paid to look good, and so their entire life is based on working out and making sure they look good. I have also viewed the amazing effects of Photoshop removing cellulite and adding fat to emaciated women. I think I got more frustrated comparing myself to other normal people in my day-to-day life. But you know what I mean of the latest craze with the “law of attraction” and using vision boards to get what you want. We’re told to use photos to visualize what we want, but it often means picking beautiful people who we desperately strive to look like.